Squamish’s largest provincial park is the 194,650-hectare Garibaldi Provincial Park, named after the iconic 2,678-metre peak, Mount Garibaldi. Although the park continues north beyond Whistler, it’s the local Diamond Head area of the park that offers an abundance of year-round recreation and an easy access point at the north end of Squamish. 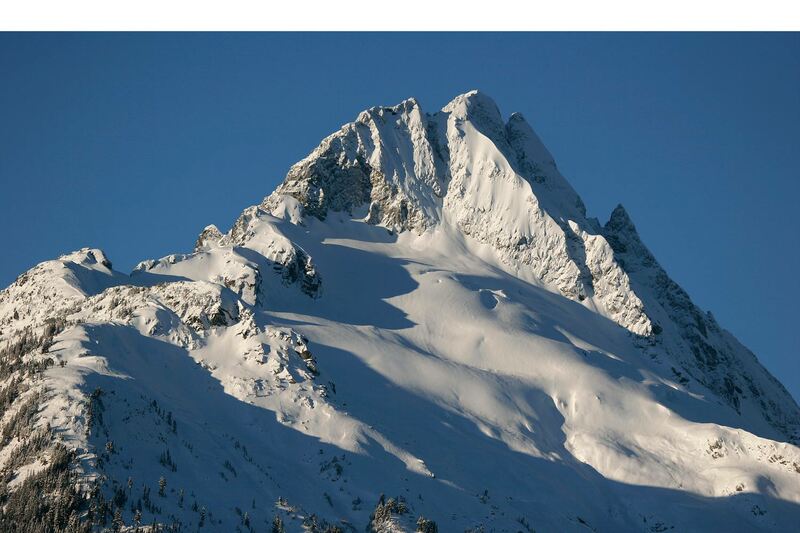 It is home to the iconic Mount Garibaldi. In the summer, expect to find immensely beautiful scenery along on a well-maintained hiking trail leading up to the Red Heather Hut, or through the meadows to Elfin Lakes. In the winter, the park’s vast terrain becomes a dream destination for ski-mountaineers, snowshoers and backcountry skiers. Camping is available at the Elfin Lakes Campground and at the Elfin Lakes Shelter which where you’ll find a propane stove, eating area and accommodations for up to 33 people. The shelter does fill up quickly. If you are planning an overnight adventure, begin the trail early in the day and bring a tent as a second option. The cost to stay at the shelter is $15.00 per person nightly. The Diamond Head area in the southwestern portion of the park includes Mount Garibaldi, 2,678 metres, Atwell Peak (a volcanic pinnacle), Opal Cone, Garibaldi Neve and Mamquam Lake. The area abounds with heather. In summer, its dainty white and pink bell-shaped flowers flourish everywhere. This is the closest access to the park from Squamish. Heading north on the Sea to Sky Highway, turn right at Mamquam Road. The road becomes a gravel road that heads steeply uphill before terminating at the parking area and trailhead. The area is accessible to low-clearance 2-wheel drive vehicles in the summer months. Chains and 4-wheel drive are required during the winter months. This scenic area surrounding Garibaldi Lake is the heart of Garibaldi Provincial Park. Within a small radius are such outstanding natural attractions as the Black Tusk, Panorama Ridge, Helm Glacier, the Sphinx, Guard Mountain, Garibaldi Lake, the Table, Sentinel Glacier, Sphinx Glacier and Castle Towers. Alpine meadows come alive with wild flowers. Mountaineers will find challenging peaks to climb. Hikers may choose from trails that are easy to difficult. Approximately 37 kilometres north of Squamish on the Sea to Sky Highway, take the Rubble Creek exit (Garibaldi Lake Road) on your right. Follow the paved road for approximately 2.5 kilometeres where you’ll find the parking lot for the area. It's no surprise that Squamish draws so many snowshoers to its trails all winter long. In winter conditions the evidence of snowshoeing is clear, coffee shops are bustling with avid outdoor enthusiasts eager to hit the hills and capture the local mountains all covered in white. If you plan on heading up to Elfin Lakes in Garibaldi Provincial Park there are a few things you should know before you go. To help, we created a top 10 list of useful information.